Didier Rous (born September 18, 1970 in Montauban, France) is a French former professional road bicycle racer. He started his professional career with Gan in 1993 before leaving for Festina in 1997, the year in which he won a stage of the Tour de France. In 1998 the Tour and in particular the Festina team were struck by a doping scandal which led to revelations that the team had organised a doping fund under the managemt of Bruno Roussel, the directeur sportif, and the team's doctor, Erik Rykaert. Rous said he had taken the blood enhancer, EPO. In 2000 he joined a new team, Bonjour, sponsored by a newspaper chain and managed by the former rider Jean-René Bernaudeau. He stayed with Bernaudeau as the team's sponsors changed and ride under its new sponsor, Brioches La Boulangère (2003–2004) and then Bouygues Telecom (2005). 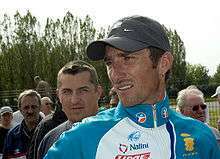 Rous said on 11 June 2007 that he was stopping racing because of health problems and joined the management of the Bouygues Telecom team.